Want to be notified of new releases in ajermakovics/jvm-mon? Console based JVM monitoring - when you just want to SSH into a server and see what's going on. 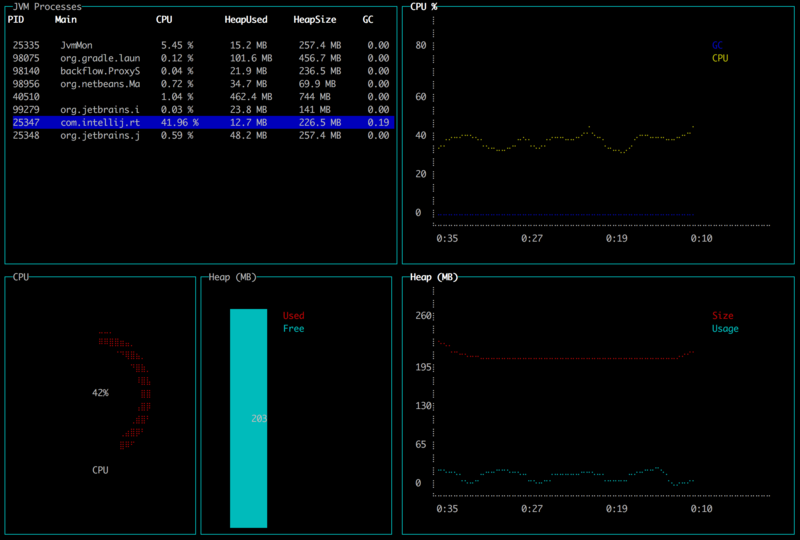 jvm-top lets you monitor your JVM server applications from the terminal. Requirement: a JDK8 on the server and JAVA_HOME environment variable pointing to it. It won't work with just a JRE. To build locally run ./gradlew installDist. Then go to ./build/install/jvm-mon/ and run ./bin/jvm-mon. To develop you will need npm on your machine and then run ./gradlew npmDeps once to get dependencies.